Blitzen does this on a form-by-form basis. There is no way to make the change to all forms at once. You will have the option to change the background, progress bar, headers, paragraph text, placeholders, and buttons / accent colors. To do this you first have to access the form you wish to change (How to Access a Form). 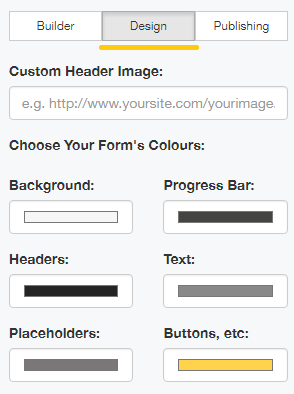 Then click on ‘Design’ in the middle panel. Scroll down until you see colors section. Click and choose the colors you wish to change to. The newly-colored form will preview in the right panel.